A half-page or full-page ad will connect you with a St. Louis tradition, and with an active, attractive audience that enjoys world-class musicals under the stars. Plus, full-season partners enjoy a variety of special benefits, including Muny tickets and on-site access to Muny attendees. 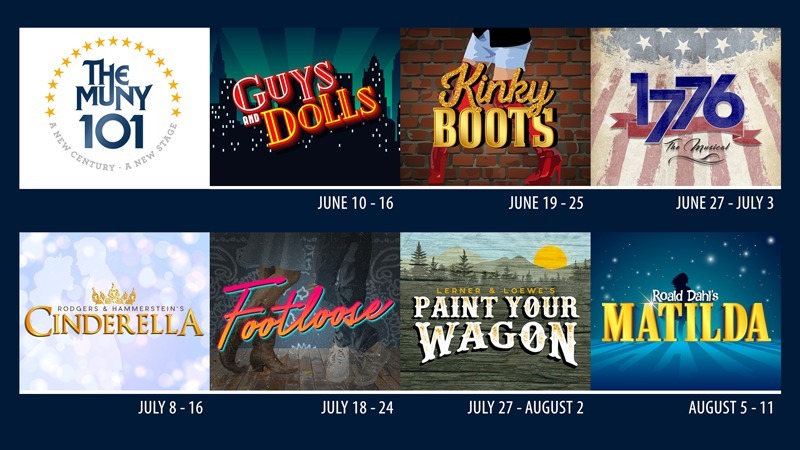 The 2019 Muny season includes 51 performances. The Muny Program consists of 80 pages on coated 60# stock. Process: web offset, 4-color process. Minimum Printing: 350,000. Contribution guarantees space for a color or black & white ad. Ad agencies please note: All contribution levels are NET. No agency discount. Orders cannot be canceled after February 22, 2019. All placements other than Other Full Page or Half Page are offered on a first-come, first-served basis. Invoices will be sent in April 2019. Final Ad trims to: 5 7/16″ (5.4375″) x 8 1/2″ (8.5″). Please add a 3/16″ (.1875″) bleed to final trim size on all sides. Keep key image elements and text 1/4″ (.25″) inside final trim size. Please include final size trim lines outside of bleed area. Do not include printer color bars, registration marks or bleed marks inside bleed area. PDF with embedded fonts (high-resolution: minimum 300 dpi). Send all art via email. Email Art to: bborger@muny.org with a copy to art@muny.org. All artwork must be camera-ready to scale. If submitted artwork is not acceptable, you may be referred to a graphic artist. Contribution levels do not include design or alteration of submitted art. Additional graphic design charges are the responsibility of the Program Partner and will be billed accordingly. Replication from email is subject to quality of file sent and cannot be guaranteed. All art must be clearly marked with Program Partner’s name and the name and dates of the show in which it is to be run. If new art is not received 15 days prior to the show, past art will be re-run. Please note: Due to the nature of live theatre, shows and dates are subject to cancellation or change. If you have any questions, please contact Bill Borger, Director of Corporate Partnerships and Program Advertising, at bborger@muny.org, or 636-288-1193.